"I Tried SCUBA!" - Try diving for FREE! Many people have always wanted to try SCUBA diving, but are unsure if diving is for them and are reluctant to commit to the time and expense of a full blown certification course. 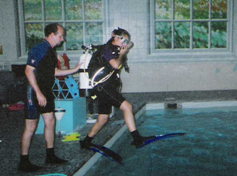 To meet this need, SCUBA Connecticut offers “I Tried SCUBA”; an introductory SCUBA experience under the careful supervision of an instructor. Prospective new divers will receive an orientation to SCUBA equipment and procedures, and then the opportunity to try SCUBA diving. All equipment is provided, but participants may bring their own masks, wetsuits, or other equipment if they have them. Minimum age is 12. Children 12-15 must have a parent participate with them in the water. Those under 18 must have a parent present to give consent. Pre-registration is required to ensure space in the program. There is a non-refundable $20.00 fee to cover use of equipment and compressed air. To enroll, or for more information, email Info@ScubaConn.com. See the Course Schedule for the next date.